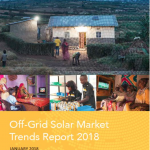 The 2018 Global Off-Grid Solar Market Trends Report is the fourth report in a biennial series established over the past 8 years as the report of record for the off-grid solar industry. The flagship Market Trends Report provides an opportunity to step back for reflection on long-term trends, challenges and opportunities—illuminating a path forward for the sector. The 2018 publication takes stock of the industry across six axes: market fundamentals, sales, the competitive landscape, finance, the enabling environment, and impact. It provides in-depth analysis on current market dynamics, projections for the coming five years, and a blueprint for how actors in this market can compete in a swiftly evolving industry ecosystem. This is the executive summary. You can find the full report here.